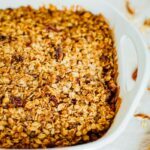 This delicious and healthy apple crisp is super easy to whip up and easily made gluten-free and vegan! 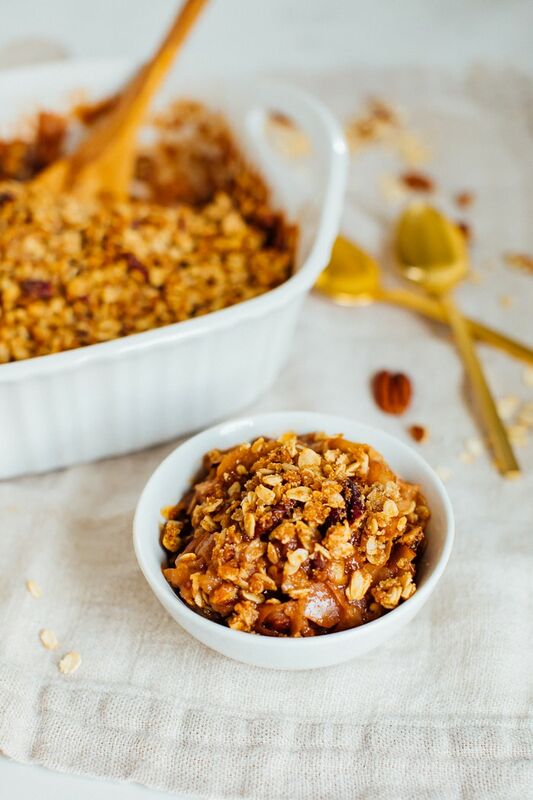 Cinnamon baked apples topped with the crispy, nutty, oatmeal topping is perfection. Riddle me this — what do you do when you have four big bags of fuji apples sitting in your kitchen after a fun day of apple picking?! Well, you can start by eating two to three apples a day, on their own or dipped in homemade date caramel. Hello, apple nachos! They’re so crisp and delicious, I found it quite easy to dwindle down the collection this way. And chopped apple slices sprinkled with cinnamon is one of my favorite after dinner snacks! If you’re not a big snacker, don’t worry I have plenty of other ideas for you. Try these slow cooker apple cinnamon steel-cut oats for bfast, make this raw apple date pie filling, a pot of no sugar added apple butter or this fall spinach salad. 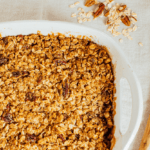 And if you’re in the mood for a sweet dessert, I highly recommend trying this healthy apple crisp recipe. It’s gluten free, easily made vegan and prepared with natural, wholesome ingredients (as per the usual here on EBF). 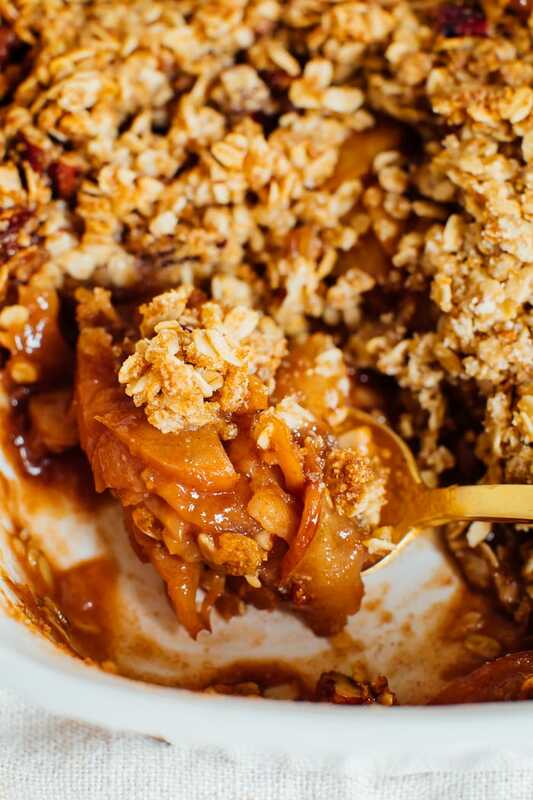 The apples are baked to caramely perfection while the oatmeal topping gives the crisp a crunchy texture. 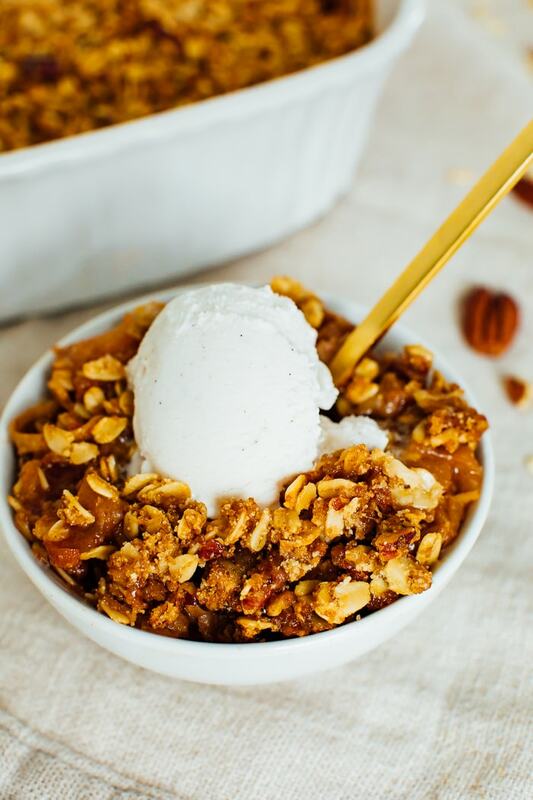 I love the apples but in my opinion, the oatmeal pecan topping totally makes the dish. 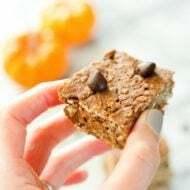 Of course, you have to remember that this is coming from the girl who loves all things crunchy — crispy muffin tops, granola, the edges of bread… bring on that crunch! Served warm, the apple crisp is absolutely delicious on it’s own. But if you really want the full experience I recommend serving it with a scoop of ice cream. I brought the crisp, along with vanilla ice cream, to a beer dinner and the combo was a huge hit. There were no leftovers. As you’ll see in the recipe below, I say that it serves 12 but I should note that it made enough to serve 18 people at the beer dinner. The servings were pretty small but when paired with the ice cream, I think it ended up being the perfect amount — especially after a big meal. Speaking of big meals, I think this would be a great dessert recipe to serve for Thanksgiving or a holiday dinner. 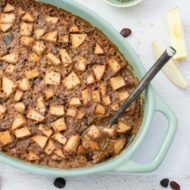 If you try this healthy apple crisp recipe be sure to leave a comment and star rating letting me know how it turns out. 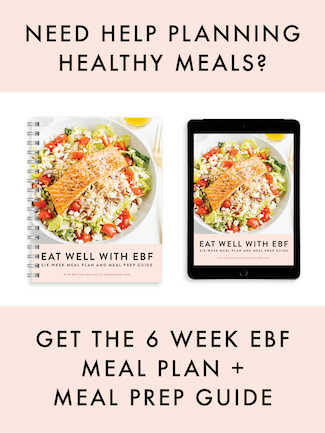 Your feedback is super helpful for me and other EBF readers who are planning to try the recipe. Make the topping by mixing together brown sugar, rolled oats, almond flour. Cut in butter or coconut oil until topping is crumb-like. Set aside. Add apple slices to a large bowl with maple syrup, lemon juice, arrowroot powder, cinnamon, nutmeg and salt. Gently toss until all apple slices are coated. Transfer apple mixture to greased 8×8 square baking dish or a 9-inch round pie pan. Sprinkle crisp topping over apple mixture. Bake for 45 – 50 minutes or until the apple filling is bubbly and the top is golden. Check the crisp around 30 minutes in. If the crisp seems to be browning too quickly, cover with foil for the remaining 15-20 minutes. Cool on a wire rack for 5-10 minutes and enjoy warm with ice cream or whipped topping. Recipe works with brown sugar or coconut sugar. If you’d like for the crisp to be less sweet, feel free to cut the sugar back to 1/2 -3/4 cup instead of 1 cup! This looks wonderful! Perfect for Thanksgiving. Apple crisp is my mom’s FAVORITE! I want to make this for her and see if she notices it’s vegan… I’m thinking, she’ll never know! I don’t have coconut sugar. Can I replace the coconut sugar for regular sugar? Sure. I’d use regular sugar for the apples and brown sugar for the topping. 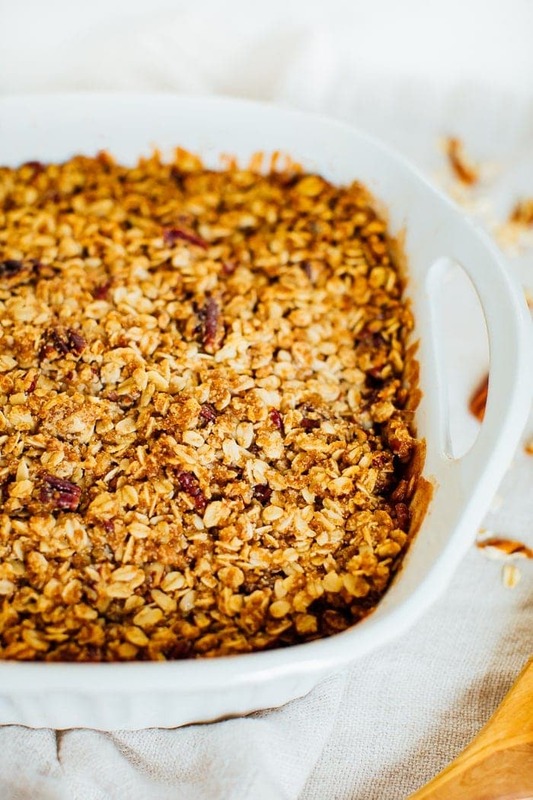 Yum an apple crisp might be next on my “fall flavors to conquer” list! Thanks for sharing! This…I just have no words. It looks incredible. I’d go vegan for it (for one meal only). 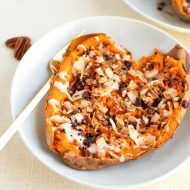 Awesome recipe – I added it right to my Pinterest board. Looks delicious! I’ve been serving this throughout fall and it’s been a big hit with everyone. So grateful for delicious vegan dessert options! This recipe is sooooooo good!! Was the perfect dessert for my Thanksgiving meal- I ended up eating for breakfast as well!! So delicious!